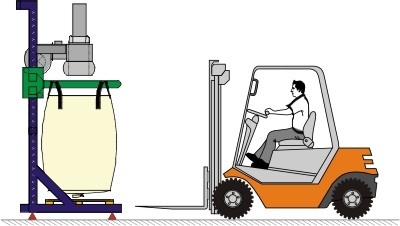 Product information "Big bag scales"
Big bag systems are used wherever bulk goods have to be filled or emptied quickly, simply and reliably. The big bag scales are used for filling all fine to coarse-grained materials. The filling process can be controlled depending on requirements (coarse flow, fine flow, receipt printout after each batch run). Big bag filling station with floor scales or pallet scales. Gravimetric filling is carried out with the aid of floor scales or pallet scales and a dispensing gate. 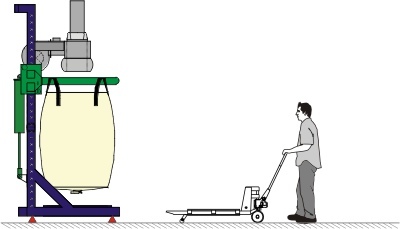 The frame construction is economical and is recommended for big bag heights of up to 1,500 mm. 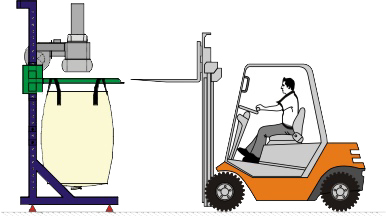 The lifting column makes it possible to dock containers of different sizes. This is recommended for big bag heights of between 1500-2200 mm as the lowering of the support frame to the operating height is possible. 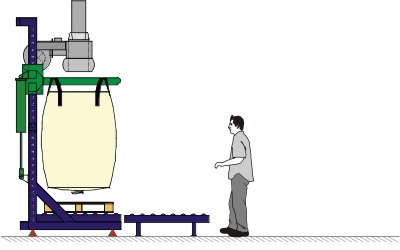 Components of big bag filler - 'JUMBOmaster' by PRO-pak, with scales. Related links to "Big bag scales"